Karen is a veteran Chief Executive with experience in the private, public, political and non-profit sectors. Her work has included running high profile national advocacy campaigns, forming and advising national boards, and founding and running her own successful marketing firm. 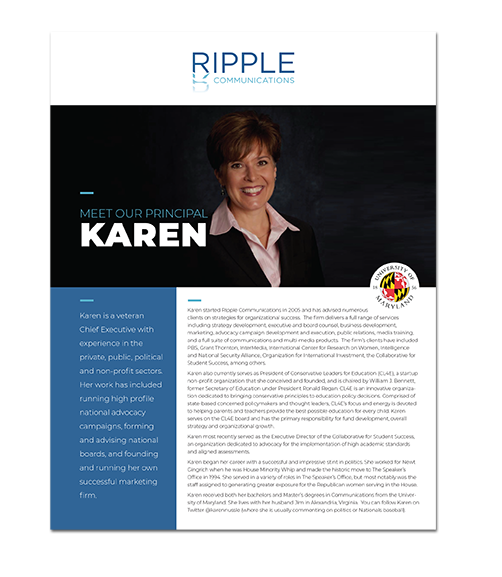 Karen started Ripple Communications in 2005 and has advised numerous clients on strategies for organizational success. The firm delivers a full range of services including strategy development, executive and board counsel, business development, marketing, advocacy campaign development and execution, public relations, media training, and a full suite of communications and multi-media products. The firm’s clients have included PBS, Grant Thornton, InterMedia, International Center for Research on Women, Intelligence and National Security Alliance, Organization for International Investment, the Collaborative for Student Success, among others. Karen also currently serves as President of Conservative Leaders for Education (CL4E), a startup non-profit organization that she conceived and founded, and is chaired by William J. Bennett, former Secretary of Education under President Ronald Regan. Karen received both her Bachelors’ and Master’s degrees in Communications from the University of Maryland. She lives with her husband Jim in Alexandria, Virginia. You can follow Karen on Twitter @karennussle (where she is usually commenting on politics or Nationals’ baseball).